When a girl dreams about her prince charming, she imagines that one day, a man who loves her and only her will come along and be a handsome, kind, loving, generous, hilarious, romantic, confident, warm-hearted and wonderful sort of prince charming. I have been blessed to have met and married that wonderful sort, but never would I have imagined that once upon a time, the prince would sometimes cook for his woman. But it makes total sense, doesn’t it? I mean, that goes right along with the kind, warm-hearted, and generous part. It seems like every month of the year presents its share of hectic chaos to our calendars, but fall frequently proves itself craziest for the schedule, since we are both teachers and I advise a literary magazine and my husband is the band director…..and this is more often than not his busier time than mine. 1–Take 2 pork tenderloins and sprinkle them with freshly ground salt and pepper on all sides. You do this in a casserole large enough to fit these loins with space to spare, says the mister. Preheat your oven to 350 while you’re at it. 2–Chop 2 red bell peppers into 1-inch chunks, along with 2-3 onions into eighths (long-ways, he says). “Leaf” the onions on top of the pork (pull apart the layers) and then add the peppers. 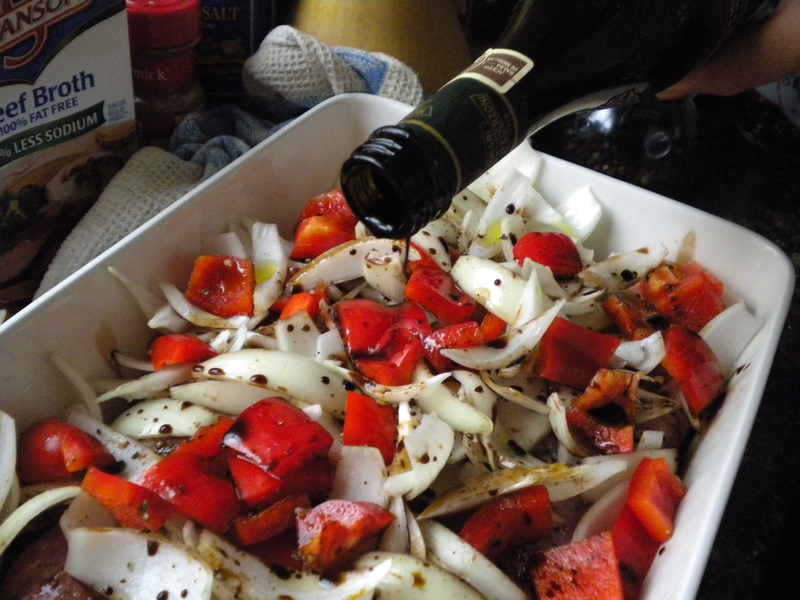 3–Coat the mixture with olive oil (3-4 T) and balsamic vinegar–at least 4 T., but we like it really balsamic-y, so add more to your taste and liking. Mix veggies with your hands to make sure it’s all super duper coated. Sprinkle a little more salt and pepper on top. 4-–Cook until the meat is 160 degrees at the thickest part; let it rest for 10 minutes before slicing up and diggin’ in!!!!!! mmmmmm mmmmmmmm good. You can really make this recipe any time of year; it belongs to no particular season, but it does definitely belong in your repertoire of recipes! This is equally fantastic when sitting atop roasted garlic and olive oil couscous, available at your local supermarket, found with all the rice. Who DOESN’t love mashed potatoes in the fall? Or year-round, for that matter? Ok, Tim chan, I mean, Larry, or whoever you are! 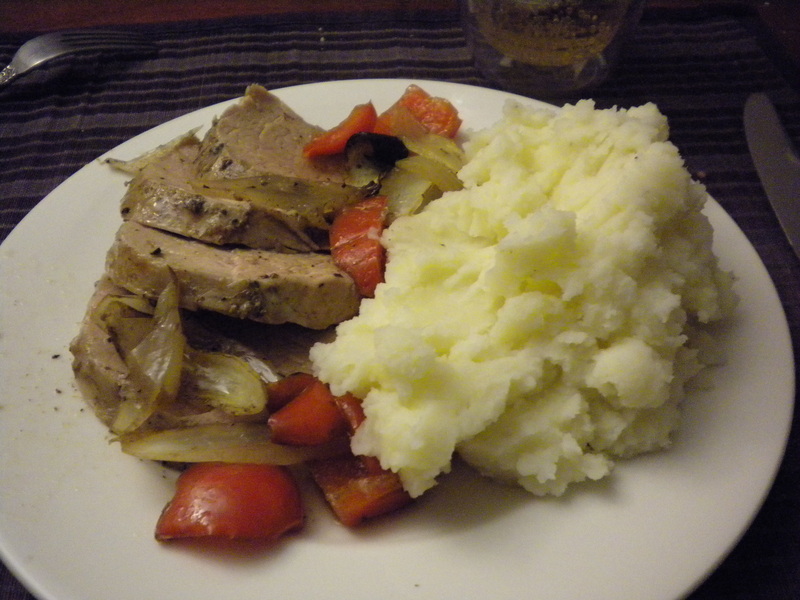 We do enjoy mashed potatoes any time of year….but I don’t really feel it in the summertime. But alas, you are fight.